Mumbai united with lakhs of people in 137 cities across the globe demanding action by individuals, peoples, governments to end the vile trade in body parts of endangered species like elephants and rhinos. The largest March for Animals of its kind ever, across the globe, the Global March for Elephants and Rhinos (GMFER) on 4th October 2014 aimed at raising awareness about the near – extinction status of elephants and rhinos and asking every government to play their part too, by increasing penalties for bribery, corruption and trafficking offenses, and by shutting down all retail outlets and ivory carving factories. Elephants, Rhinos and such other large animals are “Keepers of our Forests”. Losing them would mean losing our forests, our rivers and an incredible ecological system. Illegal poaching these animals are increasingly being linked to funding of organised crime and armed militia groups, fuels conflict and poses environmental, development and security challenges. Our cultural need to own Ivory products or use horns of animals in medicines is leading these animals to extinction. Thane SPCA was asked by the Global Organisers to host the event in Mumbai. Mumbai marched through an area which has a lot of rich traders of ivory- which houses the Mantralaya, Hon’ble the High Court, State Police Headquarters, 5 Star Hotels – all in all a sensitive zone. To add to our woes, this was a long weekend of almost 5 days, the Eid coming up and the Code of Conduct stretch for the Legislative Assembly elections around the corner. So we were not given permission to March the entire way. 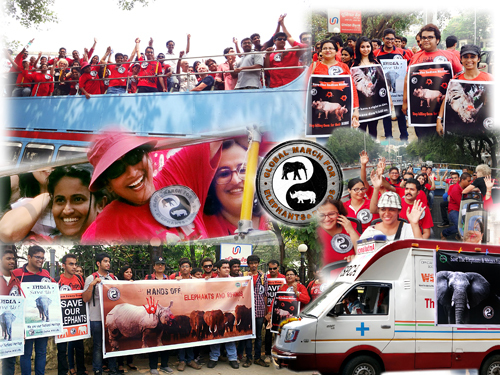 Clad in eye catching red we started off with a gathering at Chowpatty, rode an open top BEST bus for 2 hours chanting Anti Poaching slogans, and ended with a silent march and demonstration at Chowpatty forming a human chain. Thane SPCA is humbled that Marchers specially flew in from Bangalore, drove in from Pune, and joined us from the U.K and the U.S. We thank Raww India with who we partnered for this March. We thank all organisers of all the 137 cities with whom we connected in spirit on this day and marched for a common cause. We marched for the 672 elephants and the 18 rhinos who will be killed worldwide in the next one week for their tusks and their horns. We marched for 100% TOTAL worldwide ivory and rhino horn BANS! We marched for strict enforcement, stiffer penalties and TO SHUT DOWN IVORY CARVING FACTORIES! We Marched for Earth’s wild icons. We Marched for their survival. We Marched against extinction. This year we were 60 of us, next year let us be 600 ! To visit Thane SPCA’s website, click here. Greetings from Quaker Concern for Animals in Britain, who also attended the Liverpool march for the elephants and rhinos. We are holding the animals and all who protect them in the Light.